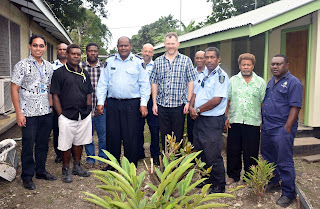 The Royal Solomon Islands Police Force (RSIPF) is among the stake holders from different Government Ministries who discussed the National Road Safety Action Plan during a meeting at the Ministry of Health and Medical Services today 21 September 2017. The National Consultation on the Development of the National Road Safety Action Plan objectives is to gather high level representatives to discuss national objectives of the road safety stakeholders in Solomon Islands, to discuss national objectives and priority actions for road safety, identify coordination mechanisms for road safety, discuss sustainable financing options and determine the process for the finalization and Government adoption of the Action Plan. “To achieve these goals and to save lives on our roads requires the engagements and support of many different sectors of the government and the citizens of this country. Road Safety is everyone’s responsibilities and everyone has a role to play,” Said Mr Manelusi. Deputy Commissioner Operations Mr Manelusi acknowledges World Health Organisation (WHO) for support in financing the program and more especially to Mr Jonathon Passmore for his time and commitment for facilitating the discussion.